An initial sketch by Scott Hewett. 2016 marked the official 20 year anniversary since Reebok and Allen Iverson first teamed up to release what has become one of the most iconic, on-court basketball sneakers of all time: The Question Mid. 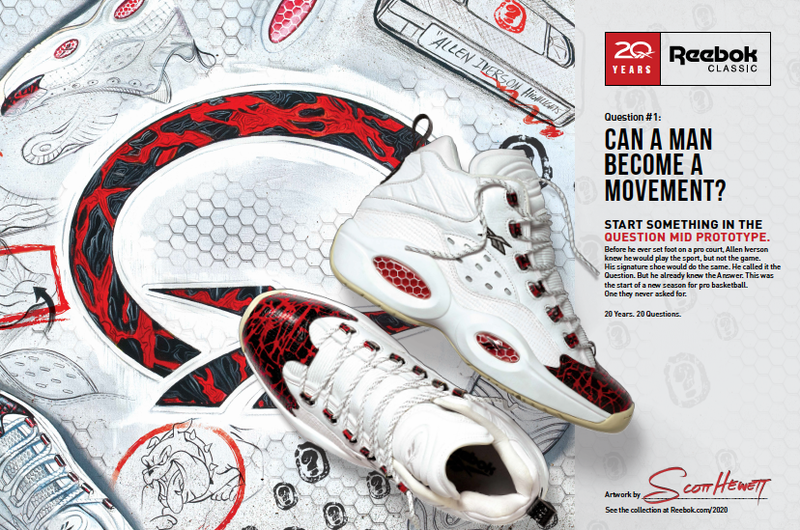 To celebrate this incredible milestone, there will be 20 unique launches of the Question Mid throughout 2016 to commemorate Allen Iverson and the undeniable cultural impact he has had on basketball as well as culture in general. Even before he stepped foot onto a professional basketball court, Reebok knew there would never be another Allen Iverson. Determined to sign the once-in-a-lifetime player, Reebok actually designed a version of Allen’s first signature shoe while he was still in college. It was called The Prototype, and it was the first canvas upon which Reebok first dreamed “what-if”. Allen never wore the Prototype on court, but the shoe had only minor changes to the design before it became the first version of the Question Mid. The hi-cut Prototype features Reebok’s revolutionary Hexalite technology and unique “?” branding on the back tab, which represents all the questions surrounding his career and whether Allen would eventually go pro. Of course, Allen Iverson being the “Answer” to the “Question” showed all his critics wrong. The Reebok Question “Prototype” is available for $200 at Reebok.com, Packer Shoes and Concepts.